Terra Arcadia: Holy Temple Ratman! By now we all had acquired more than a passing familiarity with the range of animal gods in the Hindu pantheon from the monkey-headed and the ever popular elephant-headed through to Vishnu's eclectic assortment of avatars. I assumed that the rat temple was to honor Ganesha's vehicle, Kroncha the rat. How a rat could possibly be a “vehicle” for an elephant is another story but in any case I was wrong. Kroncha is in fact a mouse, not a rat, and the Karni Mata was built to honor Laxman, stepson of the goddess Karni Mata. Laxman died accidentally and Karni Mata begged Yama, the god of death, to bring him back to life. He did so, but as a rat. 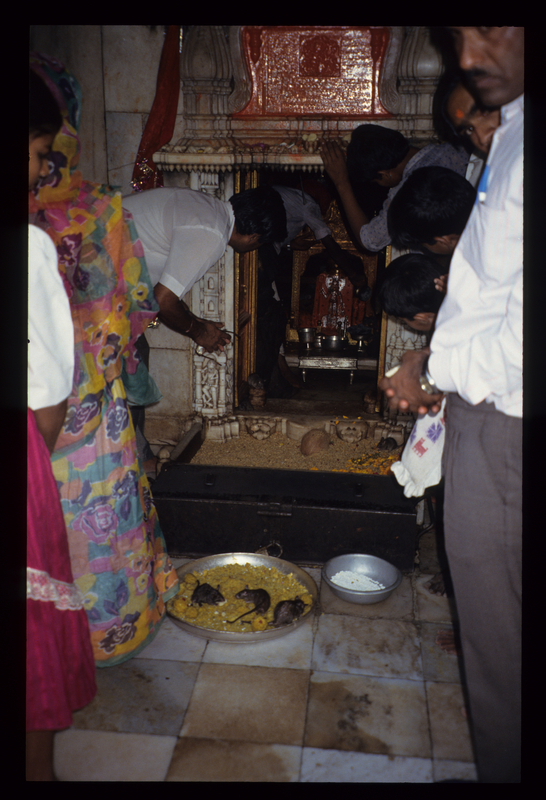 The 20,000 rats that inhabit the temple today are descendents of Laxman. So, lacking anything better to do and, to be honest, somewhat brain addled by heat, poor nutrition and dysentry, we agreed with Paul and off we went. To the rat temple. Now a thing that you should know about Hindu temples if you don't already is that you have to take your shoes off before going in. Another thing you should know about Hindu temples is that even the famous ones can actually be quite small and cramped inside. And finally, one more thing you should know, this time about rats, is that rats poop a lot. 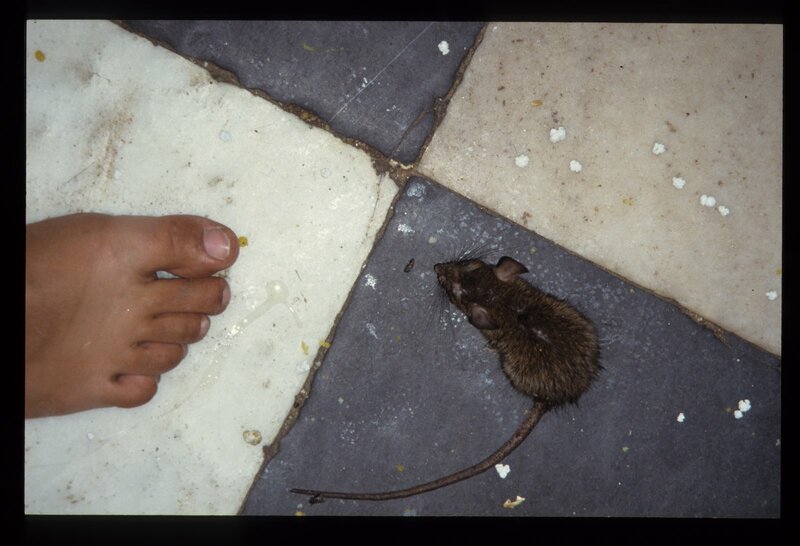 Bare feet, small space, 20,000 rats pooping. It well may be that the temple was beautifully carved and decorated inside, but I will freely admit that the entirety of my attention was directed towards foot placement. I stood on my toes and scanned the tiled floor, calibrating each step with great care. But still it was nasty. And I like rats. I can only imagine what kind of a state a rat-o-phobe would be in. The poop wasn't the only thing to be on alert for. The mortality rate among the rats seemed to be quite high, despite the lavish attention and care accorded them by the priests, so while the live ones would scatter with each step, sometimes running right over your feet in their panic, the dead naturally did not and thus presented additional obstacles. And should you accidentally be the cause of a rat's demise, say a slow witted, slow moving one, you will be obliged to donate a gold rat to the temple. I'm absolutely serious. This funhouse atmosphere kept us amused for, oh, perhaps a minute or two before we began trying to make our way to the exit. 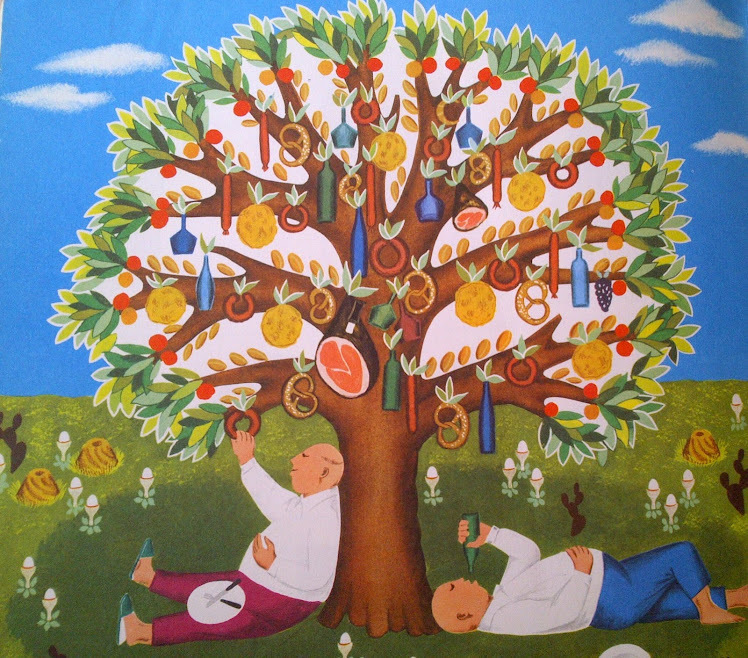 On the way out I saw a pilgrim bend down and pick up a gnawed upon piece of rat food (amusingly called “bhog”). He made a prayer motion and popped it in his mouth. Eating food the rats have chewed on is apparently a high honour. I was, however, completely satisfied with my state of dishonour and moved on, thinking only about clean water, a bucket and a towel.